The global membrane separation technology market is projected to reach USD 28.10 billion by 2022 at a CAGR of 7.2%. The base year considered for the study is 2016 while the forecast period is from 2017 to 2022. Membrane separation technology is used to separate and to purify a specific component from the rest of the mixture. This technology is widely used for commercial and industrial purposes. Certain properties of membrane separation technology, such as durability, porosity, permeability, stability, and selectivity, make them an indispensable element in various industrial applications. Membrane separation technology are widely used in water & wastewater treatment, industrial, laboratory, medical, food & beverage, and research applications to purify, concentrate, sterilize, or separate samples. Water is a basic necessity for human existence and industrial development. Increasing population and expansion of industries increases the demand for water, which in turn, increases the need for membranes in water & wastewater treatment applications. Moreover, increasing concerns regarding wastewater discharge and drinking water quality is also driving the membrane separation technology market, globally. The scarcity of pure water has provided opportunities for use of membranes in brackish water purification. High purity standards and stringent regulations regarding drinking water and industrial wastewater discharge are leading to increased water and wastewater treatment activities that use RO, UF, and MF membranes on a large scale. In the U.S., it is mandated by the law that citizens should be given clean and abundant water. The EU’s bathing water standards policy have rules for safeguarding public health with clean bathing water and so on. All these policies are set to increase water & wastewater treatment processes across the world. This is driving the growth of the global membrane separation technology market. The top-down and bottom-up both approaches have been used to estimate and validate the size of the global membrane separation technology market and to estimate the size of various other dependent submarkets. The research study involved the use of extensive secondary sources, directories, and databases such as Hoovers, Bloomberg, Chemical Weekly, Factiva, Commonwealth Scientific and Industrial Research Organization (CSIRO), Securities And Exchange Commission (SEC), American National Standards Institute (ANSI), Organization for Economic Co-operation and Development (OECD), and other government and private websites, to identify and collect information useful for the technical, market-oriented, and commercial study of the membrane separation technology market. The major players covered in the report are The Dow Chemical Company (U.S.), The 3M Company (U.S.), GE Water & Process Technologies (U.S.), Toray Industries (Japan), Merck Millipore (Germany), Asahi Kasei Corporation (Japan), Hydranautics (U.S.), Danaher Corporation (U.S.), Pentair plc (U.K.), and Koch Membrane Systems Inc. (U.S.). In September 2016, Asahi Kasei Corporation completed the construction of hollow fiber membranes plant in Oita, Japan. These membranes are used in biopharmaceuticals and plasma derivatives. Through this expansion, the supply capacity of the company increased by 10,000 m2 per year. In May 2015, GE launched a new membrane system to remove seawater sulfate from injection water for offshore oil production. This new SWS removal membrane can also be used in conjunction with GE’s existing RO membranes to provide water with low salinity flooding, polymer flooding, and other forms of enhanced oil recovery. In October 2016, Nitto Denko launched two new RO membranes (CPA7-LD and ESPA2-LD MAX) for industrial, municipal water, and re-use applications. This development strengthened the company’s product portfolio. In June 2015, The Dow Chemical Company (U.S.) launched new IntegraFlux. The XP fiber technology in the membrane provides higher flux, higher water recovery, and low waste at low energy consumption. This development has strengthened the company’s product portfolio for UF membranes. 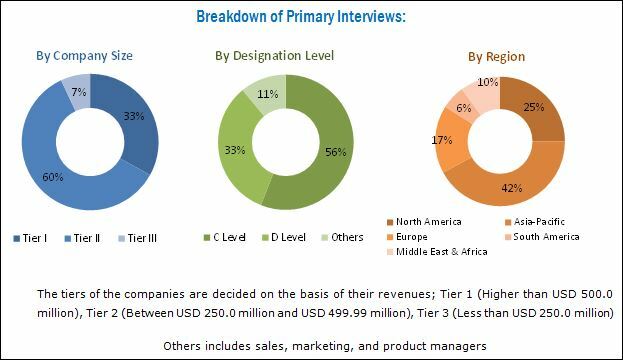 This research report categorizes the membrane separation technology market on the basis of technology, application, and region. What are the upcoming trends for membrane separation technologies in developing nations? Country-level analysis of the membrane separation technology market is provided by technology and application. The global membrane separation technology market is projected to reach USD 28.10 billion by 2022 at a CAGR of 7.2%. The membrane separation technology market has witnessed significant growth in the recent years, and this growth is projected to persist in the coming years as well. Membrane separation technology is used to separate and to purify a specific component from the rest of the mixture. This technology is widely used for commercial and industrial purposes. With recent developments in membrane separation technology market and increasing demand for reduction of energy consumption in the chemical processing industry, newer membrane technologies and processes are being developed for new applications. There are various types of membrane separation technologies are considered in the report including reverse osmosis (RO), ultrafiltration (UF), microfiltration (MF), nanofiltration (NF), and others. Among these technologies RO accounted for the largest market share due to its cost effective nature. NF is the fastest growing technology owing to its increasing usage to separate trace amounts of salts and other dissolved solutes from already treated water to produce ultrapure water for the electronics industry. 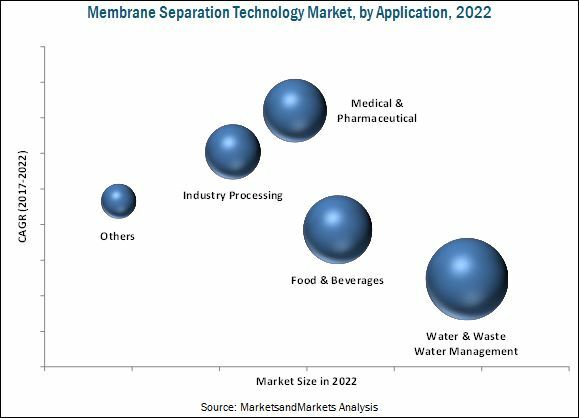 North America, Europe, Asia-Pacific, Middle East & Africa, and South America are the main regions considered for the membrane separation technology market in the report. Asia-Pacific is the largest membrane separation technology market. This region dominates the membrane separation technology market due to the extensive usage of membrane separation technology in medical & pharmaceutical, water & wastewater treatment, and chemical processing sectors. The market for the MEA region is projected to witness the second-highest growth rate between 2017 and 2022 owing to the increasing demand for water treatment plants in the region. Though the membrane separation technology market is growing at a significant rate, a few factors such as the high price of equipment, shift of the end-use market from developed countries to emerging countries, and the rising cost of production hinder the growth of the market, globally. Membrane separation technology is used in various applications such as water & wastewater treatment, industrial processing, medical & pharmaceutical, and food & beverage. Membranes separation technology in water & wastewater treatment plants are used for microbial removal, desalination of sea water, sewage treatment, wastewater treatment of water from industries, processing of natural mineral water, production of potable water, and treatment of brackish water. The two major membrane processes used for water & wastewater treatment include RO and NF. Knowing which membrane system solution suits the best for water treatment challenge helps to increase the plant efficiency, along with reduced operating & chemical costs, and compliance with increasingly stringent waste disposal regulations. Despite being a relatively mature sector, there are still emerging and potential applications in protein isolation and other separations. An important trend for membranes in the food & beverage sector also relates to wastewater treatment. As disposal regulations have become stringent and sewage surcharges escalate, the industry is being forced to look for new cost-effective water treatment technologies using membranes. Major technologies used in food & beverage industry are RO, NF, UF, MF, along with some of the less used technologies such as pervaporation, gas transfer, and membrane distillation. Membranes find widespread applications in the biopharmaceutical industry as its products and their intermediates are susceptible to degradation due to heat and chemical treatment, making it difficult to separate those using alternative technologies. Other medical applications of membranes involve artificial kidneys transplant, blood oxygenators, and controlled release drug delivery system. Microfiltration membranes are widely used for producing injectable drug solution. The market for pharmaceuticals is expected to continue to grow at a relatively high rate in the next five years, providing a large market for manufacturers of microfiltration membranes. What are the upcoming hot bets for membrane separation technology market? How market dynamics is changing for different types of technology in different applications? The Dow Chemical Company (U.S.), GE Water & Process Technologies (U.S.), The 3M Company (U.S.), Toray Industries (Japan), and Merck Millipore (Germany) are the leading companies in this market. These companies are projected to account for a significant share of the market in the near future. Entering into related industries and targeting new markets will enable the membrane separation technology manufacturers to overcome the effects of volatile economies, leading to diversified business portfolios and increase in revenues. Other major membrane separation technology providers are Asahi Kasei Corporation (Japan), Hydranautics (U.S.), Danaher Corporation (U.S.), and Koch Membrane Systems Inc. (U.S.). 10.8 Koch Membranes Systems, Inc.